Adverbial phrase meaning: toward, to (in connection with), against, in regard to, whereas, in contrast to. 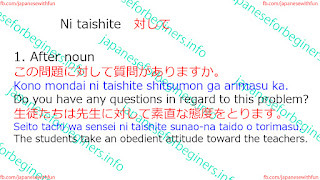 It becomes ni taisuru when used as an adjectival phrase. Kono mondai ni taishite shitsumon ga arimasu ka. Do you have any questions in regard to this problem? 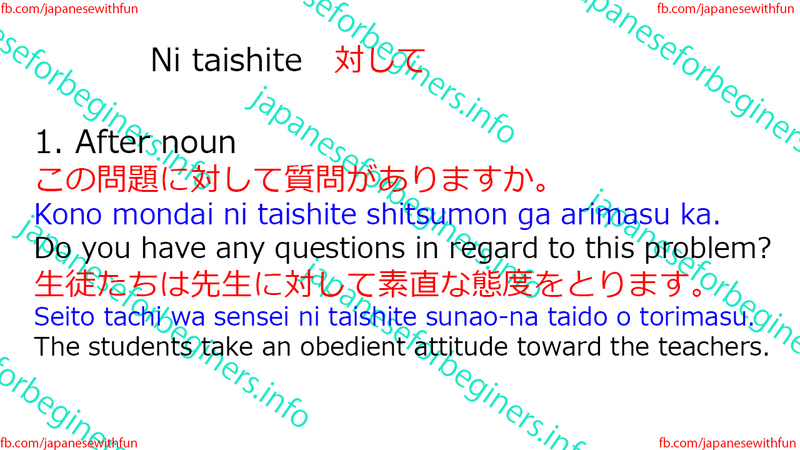 Seito tachi wa sensei ni taishite sunao-na taido o torimasu. The students take an obedient attitude toward the teachers. Watashi wa kanojo ni taishite koui o motte imasu. I feel affection toward her. Watashi wa tanin no puraibashii ni taishite kanshin o motanai. I have no interest in other people's private matters. Kare wa watashi ni taishite urami o motte iru you desu. Go nin ni taishite ichi dai konpyuutaa ga arimasu. There is one computer to every five persons. Sora ga aoi no ni taishite yama wa aka datta. In contrast to the blue sky was the red mountain. Yotou ga sore ni sansei shita no ni taishite yatou wa hantai shita. The ruling party supported it, whereas the opposition parties were against it. Kare wa yowai mono ni wa shinsetsu-na no ni taishite tsuyoi mono ni wa tsumetai. He is kind toward the weak, whereas he is cool toward the strong. Kore ga shitsumon ni taisuru kotae desu.